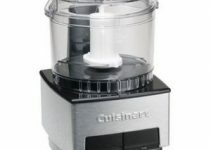 From many Cuisinart Food Processors CH-4DC is categorized into the elite category. CH-4DC is explained quite beautifully by Amazon here but we will continue with our review. It’s a small 4 cup size Cuisinart mini food processor. Carefully engineered compact design with simplicity in touchpad. Safety is prioritized in CH-4DC as the blade though very sharp but won’t move around when you are about to remove the mix after a session. The special one available in die-cast with high-quality aluminum non-magnetic finish will make your kitchen look more elegant. Its non-magnetic aluminum dire cast metal base is the best one to choose but other plastic versions are also available if you are on a tighter budget. Die-cast one has been regarded as very good in terms of it quality specifically for the fact that it does not move around. Other options of Black, metallic red and white versions are also available on slightly lower price but die-cast is the best one to buy if you are planning to buy one. 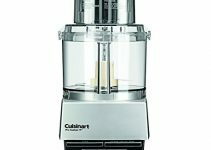 From mini Cuisinart food processors, CH-4DC has 4 cup capacity and lies just at boundary region to mid-size Cuisinart food processor. Even the 14 cup elite editions come with 4 cup bowl. This size is handy and will lower your burden of multiple chopping batches. The top lid has a small pen point size hole where you can pour in liquid to make a more smoother and fluidly mix. You can grind rice to rice powder, shred cooked chicken, make coleslaw from carrots and cabbage, chop herbs, onions, garlic, grind spices, hard cheese in this. If you have a small family and a little baby you can also puree food in this Elite food processor. Although it is sold mainly as a grinder and chopper but it is more versatile in nature. You can also use it for puree, emulsifying and mixing. Blades are made of stainless steel to ensure that they will last for longer time. 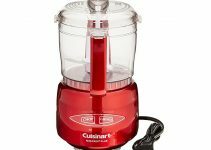 With Auto-reversing capability and SmartPower technology this Cuisinart mini processor offers versatile features. Bowl is made of BPA free plastic. A machine is sturdy and has a strong build. The motor noise level is moderate and is of 250 watts power. Like most of the Cuisinart food processors, CH-4DC is also dishwasher friendly. There is a hole in the bowl but its raised 2 inches high. The product comes with a spatula to clean the bowl. Do not put more than capable in the bowl or up to full capacity as the motor might burn. Overall the machine is very durable and with 18 months warranty, it is a good product to add to your kitchen arsenal. Here check what current offer actual buyers have to say about CH-4DC at Amazon. It’s a nice piece to include in your kitchen counter.